Wang, B., Li, D. L., Chen, T. Y., Qin, Z. Y., Peng, W. X., and Wen, J. L. (2017). "Understanding the mechanism of self-bonding of bamboo binderless boards: Investigating the structural changes of lignin macromolecule during the molding pressing process," BioRes. 12(1), 514-532. Binderless boards were produced from bamboo particles through a molding pressing process. The boards were investigated for the chemical and structural changes of lignin and their mechanical strengths to evaluate the mechanism of self-bonding. The structural transformations of milled wood lignin (MWL) obtained from raw bamboo and molding pressed bamboo boards were investigated by Fourier transform infrared (FT-IR), gel permeation chromatography (GPC), quantitative 13C-NMR spectra, two-dimensional heteronuclear single quantum coherence (2D-HSQC) spectra, 31P-NMR, thermogravimetric analysis (TGA), and differential scanning calorimetry (DSC) techniques. Both molding press temperature and time affected the distribution and abundance of typical lignin linkages (β-O-4′, β-β′, and β-5′), as well as the S/G ratios of the lignin, demethoxylation, and the contents of attached molecules (PCE). In addition, a decrease in aliphatic OH and an increase in phenolic hydroxyl groups occurred in lignin as molding pressing proceeded. The optimal internal bonding strength (0.98 MPa) of the bamboo binderless board was obtained under the condition of 180 ºC for 20 min. Although the lignin obtained under this condition was structurally similar to the raw MWL, the decreased molecular weight, increased phenolic hydroxyl groups, and observable glass-transition temperature (thermal softening of lignin) provide some evidence to explain the acceptable internal bonding strength. In recent years, the demand for fiberboards has been growing. However, the major problem of adhesives in fiberboards is formaldehyde emission, which causes health and environmental concerns (Zhang et al. 2015). The strict environmental protection, human health safety regulations, and mounting raw material costs have facilitated some research into reducing or replacing the amount of harmful and/or expensive adhesive components with more environmentally friendly and safer alternatives (Widsten and Kandelbauer 2008). The environmental protective adhesives or bio-based adhesives have been developed to deal with environmental problems. To eliminate these concerns, formaldehyde-free adhesives made from natural resources, including lignin (Mansouri et al. 2007), soy protein (Kumar et al. 2002), and starch (Imam et al. 2001) have been extensively investigated. However, high cost and relatively poor mechanical properties limit their industrial applications (Zhang et al. 2014). Therefore, it is a green and promising strategy to produce fiberboards without adhesives, from both economic and environmental perspectives. Binderless fiberboards have been made from the refined bark of black spruce, but wood fibers and bark were fabricated in a sandwich structure to obtain acceptable results (Gao et al. 2011). There has been systematic research on binderless fiberboards since the 1980s. Mobarak et al. (1982) prepared binderless lignocellulose composite from bagasse and discussed the potential mechanism of self-bonding (Mobarak et al. 1982). Shen (1986) produced binderless fiberboards with a feasible process (Shen 1986). Different raw materials, such as coconuts (Dam et al. 2004), oil palm (Shao et al. 2009), and bamboo (Baskaran et al. 2012) have been evaluated for the production of binderless fiberboards. Historically, enzymatic and chemical pretreatments of raw materials can improve the performance of binderless fiberboards, owing to their ability to form free radicals on the surface of fibers (Widsten and Kandelbauer 2008). Additionally, steam explosion before hot pressing and steam injection explosion have been developed to produce more reactive sites for self-bonding, which improves the performance of binderless fiberboards (Widyorini et al. 2005; Quintana et al. 2009). However, research and production of binderless fiberboards is mostly limited to the laboratory because the mechanisms of self-bonding in binderless fiberboards are unclear. Studies of the self-bonding mechanisms (to determine the chemical and compositional changes of binderless fiberboards) have used modern analysis methods, such as Fourier transform infrared spectroscopy (FT-IR), nuclear magnetic resonance (NMR), and gas chromatography-mass spectrometry (GC-MS). However, no obvious change of the specific or functional groups have been observed during hot pressing (Okuda et al. 2006a; Xu et al. 2006). Several potential explanations for the self-bonding mechanism have been proposed, such as lignin-furfural linkages (Suzuki et al. 1998; Okuda et al. 2006a) and lignin condensation reactions (Okuda et al. 2006a, b). In addition, a physical phenomenon involving thermal softening of lignin has been suggested to be partially responsible for fiberboard formation (Bouajila et al. 2005). The mechanism behind this process may vary depending on the raw materials and specific manufacturing process. Therefore, elucidating the self-bonding mechanism is important and beneficial for the improved performance of binderless fiberboards and their further industrialization. Moreover, efforts to reduce the cost and improve the physical and mechanical properties of binderless fiberboards are needed. The pressing temperature is one of the most important manufacturing parameters influencing the binderless board properties (Mancera et al. 2008; Hashim et al. 2011). In this study, hot-pressing processes with high temperatures (180 to 240 ºC) and high pressures (5 to 6 MPa) were applied to prepare bamboo binderless boards. Heat treatment modifies the chemical composition and molecular characteristics of bamboo cell wall polymers to different degrees, especially in the physicochemical changes of hemicelluloses and lignin during hot-pressing. The structural changes and thermal softening of lignin is partly responsible for the self-bonding mechanism of binderless fiberboards, and the most important components in the plant cell wall are native lignins in raw bamboo. The chemical composition and structural characteristics of prepared binderless fiberboards were systematically investigated by an exhaustive chromatographic and spectroscopic characterization. In short, the purpose of this study was to investigate the structural changes of lignin macromolecule during molding pressing, which facilitates the understanding of the mechanism of self-bonding of bamboo binderless boards during the process. Bamboo was obtained from JiangXi, China. The bamboo culms were dried in an oven at 50 °C, followed by grinding to obtain particles (20 to 60 mesh). The chemical compositions of the raw bamboo and the corresponding binderless boards were analyzed as has been described (Sluiter et al. 2008), and the results are presented in Table 1. In brief, the principal composition (%, w/w) of the dried bamboo particles were cellulose (expressed as glucan) 41.33%, hemicelluloses (expressed as xylan, araban, and galactan) 29.30%, and lignin 25.88%. All chemicals used were of analytical or reagent grade and directly used as purchased without further purification. Air-dried bamboo particles (20 to 60 mesh, 8 to 10% moisture content) were heated in a compressive molding machine (testing machine, Fig. S1), hand-formed into homogeneous mats using a forming box (50 × 50 cm2), and pressed at a pressure of 5 to 6 MPa at 180 to 240 °C for 10 to 30 min, by adjusting the target board thickness to 20 mm. The binderless boards were prepared on a laboratory scale by the standard techniques under controlled conditions (Table S1). The prepared binderless boards (Fig. S2) from the bamboo powder were named MPB-1 (molding press bamboo-1), MPB-2, MPB-3, MPB-4, MPB-5, and MPB-6. The MPB-6 sample was composed of 100 parts of bamboo and 40 parts of biorefinery corncob lignin, which was obtained from Shandong Longlive Bio-technology Co., Ltd, Shandong, China. The physicochemical properties of this biorefinery lignin was reported in a recent publication (Yang et al. 2014). The properties of the binderless boards were evaluated in accordance with the Chinese standard for fiberboards (GB/T 11718 2009) with the specimen thickness of 5 mm and size 50 mm × 50 mm. The content testing speed was 1.5 mm/min. To evaluate the physical properties of the six binderless boards (MPB-1 to MBP-6), the internal bonding strength (IBS) test, an index of self-bonding, was conducted on a universal testing machine (UTM6503, Shenzhen Suns Technology stock CO. LTD. China) and compared with Chinese standard GB/T 11718 (2009). All experiments were conducted in triplicate. Milled wood lignin (MWL) samples were prepared according to the classical method with some minor modifications (Björkman 1954). In detail, the 30 g ball-milled bamboo and binderless boards were directly suspended in dioxane/water (96:4, v/v) with a solid-liquid ratio of 1:20 (g/ml) and extracted at ambient temperature for 24 h. The mixture was filtered and washed with the 96% dioxane/water until the filtrate was clear. These operations were repeated twice. The supernatant fluid were concentrated to 1/10 volumes, and then transferred into 3 volumes of 95% ethanol to induce hemicellulose precipitation. The hemicelluloses were removed by centrifugation. The separated supernatant were then concentrated to 1/10 volumes and then precipitated in 10 volumes of acid water (pH 2.0, adjusted by 1M HCl). After being centrifuged and washed with acidified water, the solids were freeze-dried to produce the crude MWL. To further purify the obtained MWL, the MWL was dissolved into 90% acetic acid (1:20). After centrifugation, the lignin solution was dripped into volumes of water (5 to 10 volumes, pH 2.0) under stirring. After standing, centrifuging, and freeze-drying, the purified MWLs (MWL, MWL-1, MWL-2, MWL-3, MWL-4, MWL-5, and MWL-6) from ball-milled bamboo and binderless boards were obtained. Note that MWL, MWL-1, MWL-2, MWL-3, MWL-4, MWL-5, and MWL-6 were extracted from MPB-1, MPB-2, MPB-3, MPB-4, MPB-5, and MPB-6, respectively. The FT-IR spectra of the MWLs were collected on a Thermo Scientific Nicolet iN10 FT-IR Microscope (Thermo Nicolet Corporation, Madison, WI) equipped with a liquid nitrogen cooled MCT detector (Holtman et al. 2006). The weight average molecular weight (Mw) and number average molecular weight (Mn) of the non-acetylated MWLs were determined with gel permeation chromatography (GPC) as previously described (Wen et al. 2012). For the quantitative 13C NMR spectra (C13IG), lignin (140 mg) was dissolved in 0.5 mL of DMSO-d6, and 20 μL of relaxation agent (0.01 M chromium (III) acetylacetonate) was added (Holtman et al. 2006). For quantitative 2D-HSQC spectra, the Bruker standard pulse program hsqcetgp was used for HSQC experiments, and the spectra were quantified as described previously (Río et al. 2012). 31P-NMR spectra were examined as described with minor modifications (Pu et al. 2011; Wen et al. 2013a). A total of 20 mg lignin was dissolved in 0.5 mL of anhydrous pyridine and deuterated chloroform (1.6:1, v/v), followed by the addition of 0.1 mL cyclohexanol (10.85 mg/mL) as an internal standard and 0.1 mL of chromium (III) acetylacetonate solution (5 mg/mL in anhydrous pyridine and deuterated chloroform 1.6:1, v/v) as relaxation reagent. The dissolved mixture was reacted with 0.1 mL of phosphitylating reagent (2-chloro-4,4,5,5-tetramethyl-1,3,2-dioxaphospholane) for 15 min and transferred into a 5 mm NMR tube for subsequent NMR analysis. Thermogravimetric analysis (TGA) was performed on a Discovery thermal analyzer (TA Instruments, Beijing, China). The sample was heated from room temperature to 800 °C at a rate of 10 °C/min in nitrogen (Holtman et al. 2006). The samples (approximately 5.0 mg) were accurately weighed into aluminum pans, which were hermetically sealed and equilibrated at room temperature for 2 h before testing. A sealed empty pan was used as reference. All differential scanning calorimetry (DSC) scans were carried out using DSC 214 (Polyma, Beijing, China), at 10 ºC/min from 25 ºC to 250 ºC under nitrogen atmosphere, and the glass-transition temperature (Tg) was obtained. All experiments were conducted in triplicate. In this study, bamboo binderless boards with different internal bonding strength were prepared by mold pressing. Although the primary purpose of the study was not to improve the mechanical properties of binderless boards, the effects of mold pressing temperature and time on the mechanical properties of binderless boards were also investigated. Notably, the binderless board prepared under the mild conditions (180 ºC, 20 min) showed an acceptable internal bond (IB) of up to 0.98 ± 0.15 MPa, which was higher than the minimum requirements of Chinese industrial standard GB/T 11718 (2009) (0.40 MPa). However, the internal bonds of the other binderless boards were reduced to 0.33 ± 0.12 and 0.14 ± 0.06 MPa at higher mold pressing temperatures (230 ºC, 10 min and 20 min, MPB-2 and MPB-3, respectively). With the further increase of hot-pressing strength (temperature and time), it should be noted that the binderless boards prepared under harsh hot-pressing conditions had poor performances in mechanical properties (MPB-4, MPB-5, and MPB-6) and the corresponding internal bonding strength (IBS) could not be tested. Interestingly, although the same mold pressing condition was applied to MPB-3 and MPB-6, the internal bonds showed huge differences. This result was attributed to the addition of industrial lignin into bamboo powder (MPB-6), which impedes the interfacial bonding of bamboo powder under the given conditions. To reveal the potential reason for the differences in the internal bond among these samples, the structural analysis of lignin extracted from bamboo after molding pressing should be investigated. The chemical compositions of the raw bamboo and binderless boards after mold pressing are presented in Table 1. The untreated bamboo particles (40 to 60 mesh) had a typical composition of bamboo (Wen et al. 2014), as was described in the materials section. After mold pressing, the relative cellulose content in the pretreated bamboo (MPB-1 and 2) has no obvious differences; however, its content was slightly increased to 41.73% as the mold pressing condition of 180 ºC for 20 min. As the temperature was further elevated to 230 ºC (10 min), the relative cellulose content in pretreated bamboo was slightly increased to 41.89%. The slightly increased cellulose content is probably due to the degradation of hemicelluloses during the hot-pressing pretreatment process. With a further increase of holding time from 20 to 30 min, the relative cellulose content declined to 33.40%, which is related to the degradation of cellulose under the harshest condition applied in this study. In contrast, the cellulose content of the pretreated binderless board prepared at 240 ºC for 10 min was 41.13%. Hemicelluloses are susceptible to heat pretreatment, as revealed by the declining hemicellulose content with increased processing intensity. By contrast, the relative amount of Klason lignin in the pretreated cell wall increased from 25.88% to 53.29% with the increasing thermal treatment, which can be explained by the degradation of other chemical constituents (namely hemicelluloses and part of cellulose, as clearly observed in Table 1). It was noteworthy that the same pretreatment condition was applied to MPB-3 and MPB-6, but the cellulose content was lower and the amount of lignin was higher in MPB-6 because MPB-6 was composed of 100 parts of bamboo and 40 parts of biorefinery lignin. The yield of MWL from raw bamboo was only 7.25% based on the Klason lignin of raw bamboo, while it was increased to 18.00% in MPB-1, 20.81% in MPB-2, 26.20% in MPB-3, 24.07% in MPB-4, and 32.73% in MPB-5. The increased extraction efficiency of lignin was attributed to the harsh mold pressing process; however, the yield of MPB-6 was remarkably increased to 35.28% compared with 26.20% in MPB-3, which was ascribed to the addition of biorefinery lignin in MPB-6. In sum, the MWL samples herein represent the “native lignin” in raw bamboo and respective binderless boards after mold pressing based on the MWL yield. Thus, investigating the structural changes of lignin macromolecules during mold pressing process elucidates the mechanism of self-bonding in bamboo binderless boards. The FT-IR spectra of the seven MWLs are presented in Fig. 1, and the IR absorption bands were assigned based on previous publications (Faix 1991; Wen et al. 2013a). The characteristic bands of primary structures and functional groups of these lignins were very similar. All spectra presented typical lignin patterns, such as aromatic ring vibrations at 1593 cm−1, 1506 cm−1, 1460 cm-1, and 1421 cm−1. The decreased intensities of these bands from 230 oC to 240 ºC for different mold pressing times implied that aromatic rings were degraded or modified in harsh conditions. In contrast, the spectrum of MWL-1 had a similar spectral pattern to that of raw MWL. Other bands representing the breathing of syringyl (S) (1327 cm−1) and guaiacyl (G) units (1265 cm−1 shoulder) were also decreased as the temperature increased. The signal at 1167 cm-1, which represented C=O in ester groups of HGS lignin, also decreased at 180 ºC and especially at temperatures higher than 230 ºC, suggesting that esterified p-coumaric acid was mostly cleaved under these conditions. Moreover, the aromatic in-plane and bending in S and G units were located at 1121 cm−1 and 1027 cm−1, respectively, and the intensity of these peaks decreased with more intense pretreatment conditions. Furthermore, as the typical band for out-of-plane C-H bending of S units, the reduced band at 829 cm−1 implied that the S-type lignin was probably degraded in these lignin fractions. However, other differences were not notable and are waiting for further verification. To investigate the effect of different molding press conditions on the molecular weight of lignin, the lignin samples were measured by gel permeation chromatography, and the data are summarized in Table 2. Raw MWL from raw bamboo presented the highest Mw (10140 g/mol) as compared to those (4600 to 7290 g/mol) from binderless boards. After a mild molding press pretreatment (180 ºC, 20 min), the molecular weight of MWL-1 slightly decreased to 7290 g/mol, indicating that this condition led to the slight degradation of lignin, thus cleaving some susceptive linkages such as β-O-4′ linkages and lignin-carbohydrate complex (LCC). The partial cleavage of these linkages modifies the adhesive property of lignin in the substrates, which is discussed in the following section. As the temperature further increased to 230 ºC, the molecular weight of the lignin samples was reduced. Additionally, the molecular weight of the lignin was decreased from 5590 to 4600 g/mol with the increased pretreatment time from 10 to 30 min, suggesting that the macromolecular lignin in bamboo particles was steadily depolymerized with the extension of the pretreatment time. In a previous publication, the β-O-4′ linkages in MWL samples from bamboo treated at 225 ºC was partly cleaved compared with raw MWL (Wen et al. 2014). 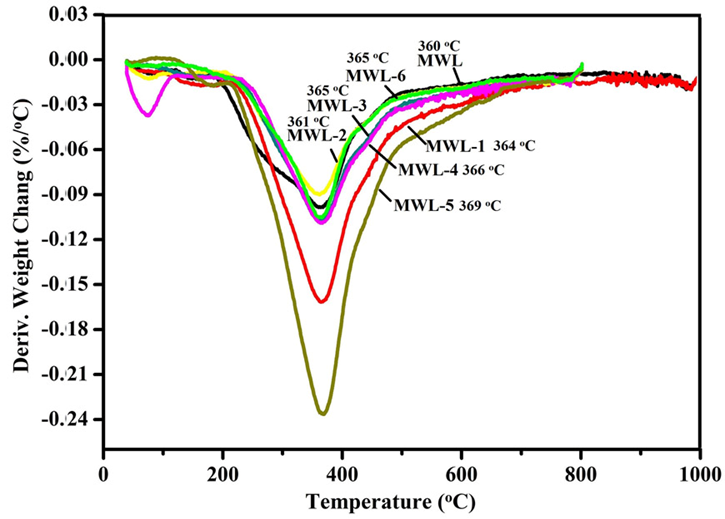 As the molding press temperature was further increased to 240 ºC for 10 min, the molecular weight of MWL-5 was 4870 g/mol, which was between those of lignin samples obtained at 230 ºC for 10 min and 30 min. Furthermore, the molecular weight of MWL-6 was 5000 g/mol, which was slightly higher than that of counterpart lignin (MWL-3), implying that the addition of biorefinery lignin alleviates the degradation of lignin during the molding press process. 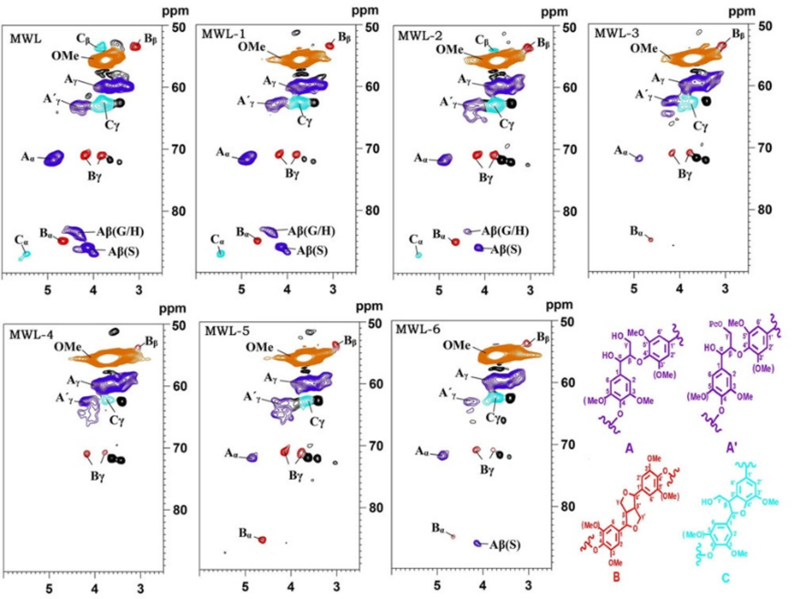 To detect the structural differences of lignin samples during different molding press pretreatments, the quantitative 13C NMR spectra of the MWL samples are presented in Fig. 2. 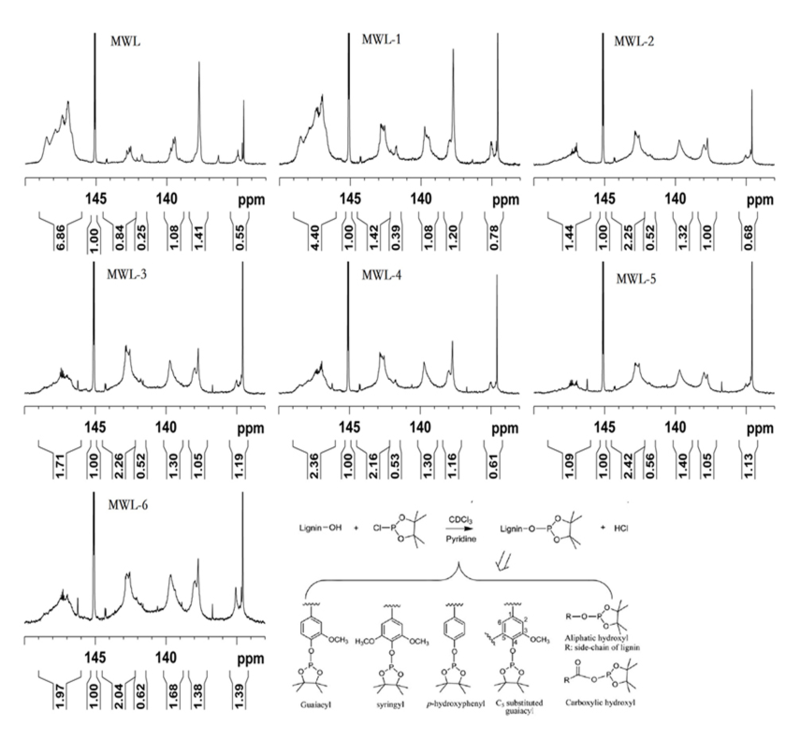 The 13C NMR spectrum of raw MWL presented a typical spectral characteristic of bamboo lignin, which was characterized by the obvious signals located at 166.5, 159.9, 144.9, 130.3, 125.1, 115.9, and 115.0 ppm, derived from C9, C4, C7, C2/C6, C1, C3/C5, and C8 in p-coumaric ester (pCE), respectively (Wen et al. 2013a). Apart from the signals represented for pCE, the S, G, and H units in MWL were also clearly distinguished in the aromatic region (Wen et al. 2013a). After the molding press process, the MWL samples from the binderless boards (180 and 230 ºC) were used to investigate the detailed structural transformations of lignin macromolecules during the molding press process. 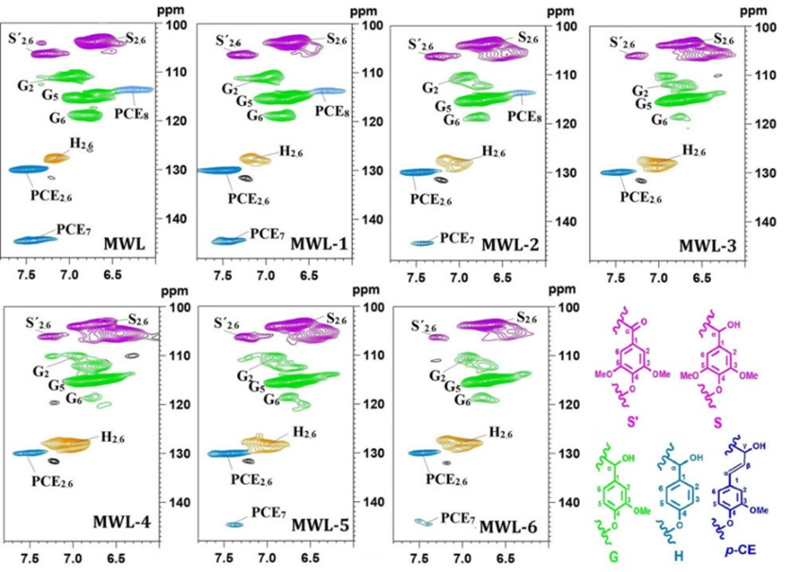 Compared with raw MWL, most signals in the MWL-1 were similar except for the following differences: (1) The attenuated signals for pCE were probably attributable to the cleavage of the cross-linked molecules (PCE). (2) The intensity of signals for β-O-4′ linkages (58.0-61.5 ppm) and etherified S3,5 (153.5-151.5 ppm) was reduced, and the intensity of signals for non-etherified G3 and S3,5 was increased, implying that β-O-4′ linkages were partly cleaved and degraded under the condition given. (3) The shift of S2,6 signals from 104.3 to 106.1 ppm suggested that condensation reaction was involved in the molding press process. 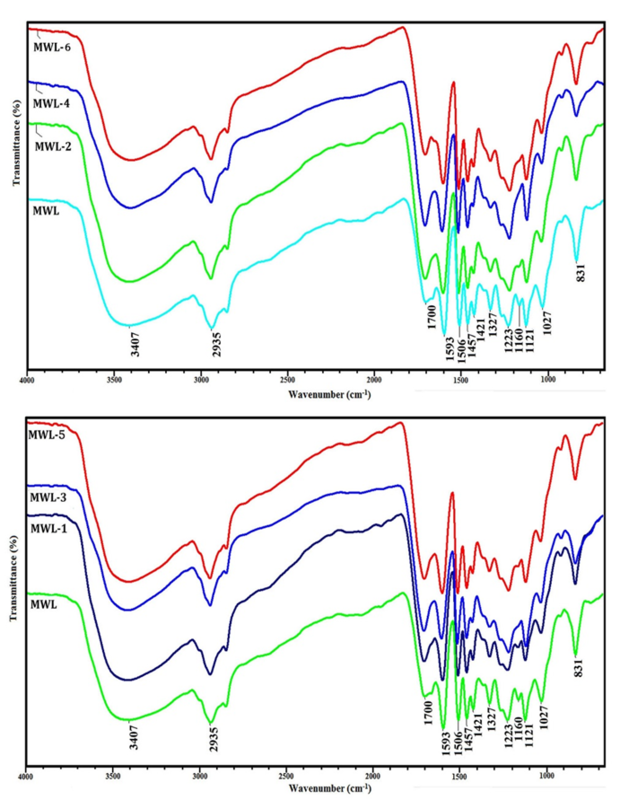 Compared with MWL-1, the lignin samples extracted from the binderless boards prepared under harsh conditions (MWL-3 and MWL-6) exhibited slightly different spectra, in which the signals for etherified S3,5 (152.2 ppm), p-coumarate (166.5 ppm), normal S2,6 (104.3 ppm), and β-O-4′ linkages (60.2, 72.4, and 86.1 ppm) mostly disappeared, suggesting that the aryl ether bonds of β-O-4′ linkages were cleaved and transformed into non-etherified S3,5 (signals at about 147.9 ppm) or G3 during the molding press process. These cleaved lignin units were further condensed into carbon-carbon linkages or other more-stable lignin linkages. Quantitative 13C NMR spectra were used to investigate the detailed structural changes of lignin during the molding press. Further comparison of the integration values of different regions revealed the quantitative structural characteristic of lignin. As shown in Fig. 2, increased molding temperature resulted in an increase in the integration of aromatic carbon-carbon regions (124.0 to 142.0 ppm) in these lignins (MWL-1, MWL-3, and MWL-6). The aliphatic region (58.0 to 61.5 ppm) of the 13C NMR spectra displayed signals from the β-O-4′ linkages in the lignin samples. 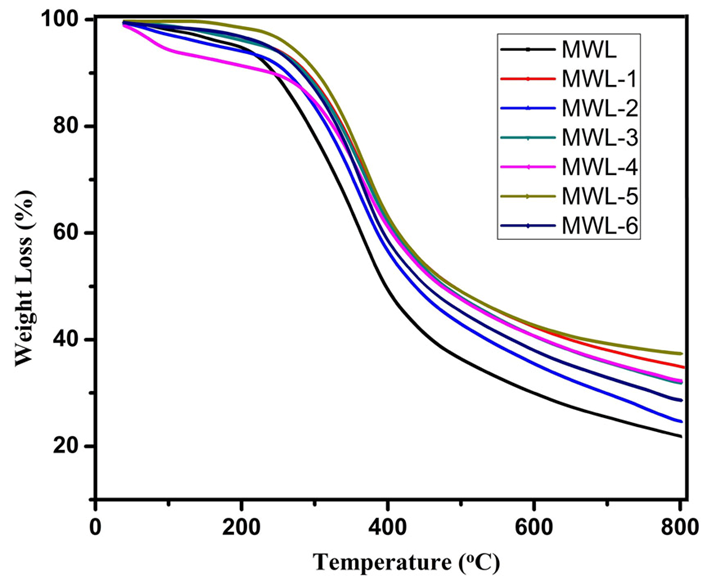 An increase in molding temperature resulted in a strong decrease of the β-O-4′ linkage content from 0.39/Ar in MWL to 0.24/Ar in MWL-1, 0.09/Ar in MWL-3, and 0.11/Ar in MWL-6. The continuously reduced OCH3 content reflected from the integrated value also suggested that demethoxylation mostly occurred under the harsh conditions. Furthermore, the contents of β-β′ and β-5′ were simultaneously decreased with the aggravated conditions, implying that these carbon-carbon linkages probably degraded under harsh conditions. 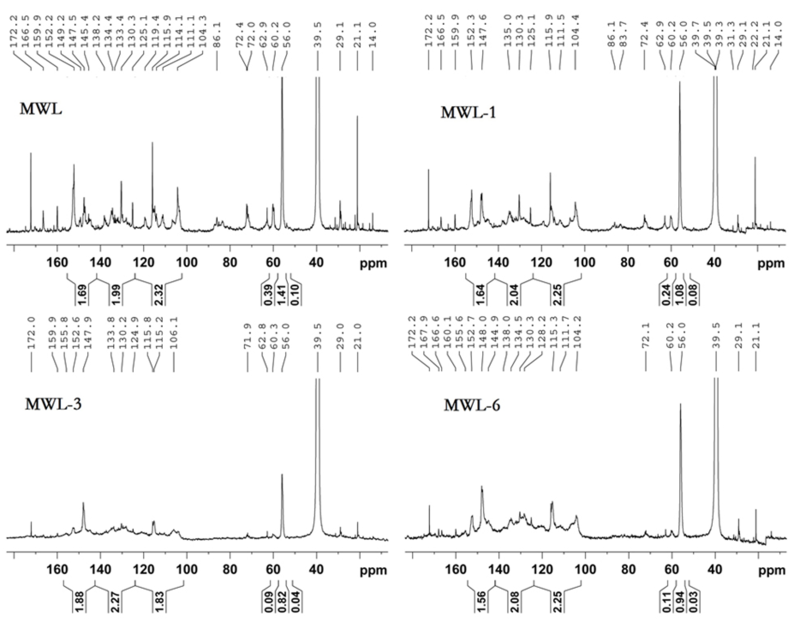 In sum, the quantitative 13C NMR spectra showed that the spectral features of MWL-1 were similar to those of raw MWL except for the reduced β-O-4′ linkages. MWL-3 and MWL-6 showed fragmented lignin with condensed structures, which were probably related to the reduced internal bond strength in binderless boards prepared under harsh conditions. To examine structural transformations and S/G ratios of lignin samples during different molding press conditions, 2D-HSQC NMR spectra of the MWL samples were collected (Figs. 3 and 4). In the raw MWL, the substructures, such as β-O-4′ aryl ethers (A), α-oxidized β-O-4′ aryl ethers (A′), resinols (B), and phenylcoumarans (C), were assigned according to previous publications (Wen et al. 2013a,b). After the harsh molding press pretreatments (230 and 240 ºC), the major substructures (β-O-4′ aryl ethers) gradually disappeared in the spectra of the corresponding MWL samples. Figure 3 depicts the identified lignin substructures in the MWL. The inter-unit linkages in MWL, β-O-4′ aryl ether (A), resinol (β-β′, B), and phenylcoumaran (β-5′, C), were identified by the related signals at δC/δH 71.8/4.88 (Aα), 83.6/4.32 (Aβ(G/H)), 85.8/4.12 (Aβ(s)), 84.8/4.69 (Bα), 86.7/5.49 (Cα), and 53.5/3.10 (Bβ), respectively (Fig. 3). The aromatic lignin units syringyl (S), guaiacyl (G), and p-coumarate (pCE) units showed prominent correlations at δC/δH 104.0/6.72 (S2,6), 110.9/6.98 (G2), 114.7/6.74 (G5), 119.0/6.80 (G6), 130.1/7.50 (pCE2/6), and 144.5/7.50 (pCE7), respectively (Fig. 4). Small amounts of oxidized syringyl units were detected as a correlated signal at δC/δH 106.3/7.30 (S′2/6). Furthermore, a small C2,6-H2,6 aromatic correlation from H units (δC/δH 128.0/7.00) was observed in different amounts. Additionally, the content of condensed S-type lignin structures was gradually increased with the enhancement of molding press pretreatments, implying that condensation reactions occurred at harsh conditions. The 2D-HSQC spectra of molding press pretreated lignin samples (from MWL-1 to MWL-6) illustrate the relative degradation of the lignin side chains and the aromatic units with enhanced molding press temperature and time as compared to that of raw MWL. As previously reported (Wen et al. 2013b), different linkages in lignin can be expressed by a comparative mode, and the results are listed in Table 3. For example, the content of β-O-4′ aryl ether in raw MWL was 44.5/100Ar, while it decreased to 30.0/100Ar in MWL-1. As the temperature increased to 230 °C, the β-O-4′ content decreased to 8.96/100Ar for MWL-2, and its content further decreased to 1.28/100Ar for MWL-3 with the extension of molding press time. In addition, the β-O-4′ content was not detected in the MWL-4 spectrum. As the temperature further increased to 240 ºC, the β-O-4′ content in MWL-5 was 2.82/100Ar, which was between those in MWL-2 and MWL-3. Although the same hot-pressing condition (230 ºC, 20 min) was applied to bamboo binderless boards (MPB-3 and MPB-6), the β-O-4′ content of MWL-3 was slightly lower than that in MWL-6, implying that the addition of biorefinery lignin prevent lignin degradation during hot-pressing process of the binderless boards. In addition to the β-O-4′ linkages, the contents of β-β′ and β-5′ linkages were continuously decreased with the increasing pretreatment intensity. For example, β-β′ and β-5′ linkages were not detected in MWL-4 because MPB-4 underwent the harshest molding press process. The change of the S/G ratio in lignin was another prominent structural alteration observed after the molding press pretreatment. The S/G ratio of raw MWL was 1.34, while it was increased to 1.69 and 2.26 for MWL-1 and MWL-2, respectively. The increased S/G ratio is mostly related to the preferential degradation of G-type lignin fragments during these processes. However, the fluctuant S/G ratio of lignin suggested that the degradation of S and G-type lignin simultaneously occurred under these conditions. Demethoxylation of lignin occurs at high temperatures (Wen et al. 2014), resulting in the elevation of H-type lignin units. 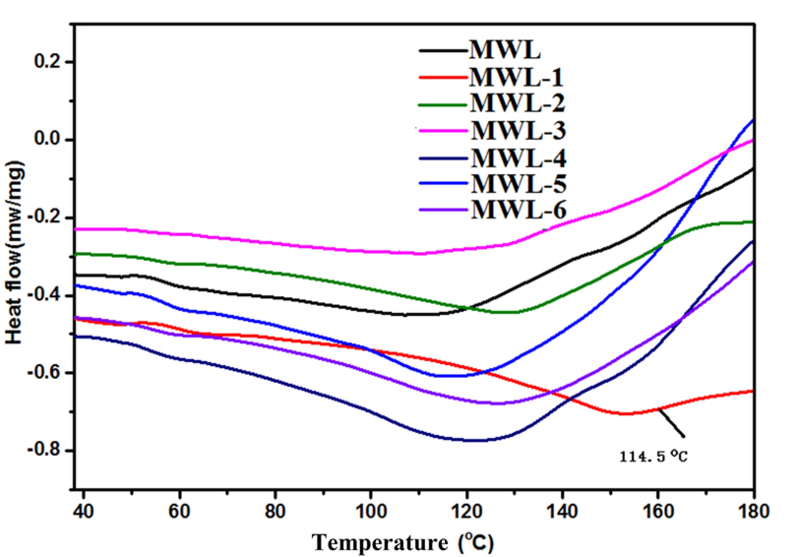 The content of H-type lignin was progressively increased from 6.45/100Ar in MWL to 25.2/100Ar in MWL-4, implying that both the increase of molding temperature and extension of molding time facilitated the demethoxylation of lignin. However, the H-type lignin content in MWL-5 was 17.0/100Ar, suggesting that the demethoxylation of lignin at 240 ºC for 10 min was not as severe as that performed at 230 ºC for 10 and 20 min. The differences in H-type lignin in MWL-3 and MWL-6 suggested that the addition of biorefinery lignin in the bamboo particles alleviated the demethoxylation of lignin in bamboo particles. As a hanging molecule, PCE content varies with different pretreatment conditions. The PCE content decreased from 25.2 to 6.03/100Ar with the anabatic mold pressing conditions. However, the pCE content in MWL-5 was 12.8/100Ar, which was between that of MWL-2 and MWL-3. Hence, both molding press temperature and time affected the distribution and abundance of typical substructures (β-O-4′, β-β′, and β-5′) in lignin, S/G ratios of the lignin, and the contents of attached molecules (PCE). Changes in these structures impact the self-bonding performance of bamboo particles. To further investigate the effects of molding press temperature and time on the structure of the lignin in bamboo binderless boards, the MWL samples were compared by quantitative 31P-NMR (Fig. 5). The aliphatic hydroxyls, condensed and uncondensed phenolic hydroxyls, and carboxylic acids in lignin were determined simultaneously. Table 4 provides quantitative data on the distribution of the various OH groups in these lignin samples. The aliphatic OH content of gradually decreased (from 3.71 to 0.59 mmol/g) with the elevated molding press temperature, implying that the hydroxyl groups in the side-chain of lignin were partly oxidized and eliminated during molding. A similar phenomenon was reported in other pretreatment processes (Wen et al. 2012, 2014). The S and G-type phenolic hydroxyl groups in these MWLs were greatly increased compared with raw MWL. Additionally, the content of S-type phenolic hydroxyl groups was higher than those of G-type phenolic hydroxyl groups, implying that the cleavage of β-O-4′ linkages (mainly composed of S-type lignin units) facilitates the release of S-type phenolic hydroxyl groups. The increased phenolic hydroxyl groups were probably beneficial to the self-bonding of lignin in the bamboo particles. During the molding press process, depolymerization and repolymerization simultaneously occurred, and the depolymerization process was a dominant reaction, as revealed by the steadily decreased molecular weights, increased content of condensed G-type lignin units (5-substituted lignin), and increased carbon-carbon (C-C) linkages (from 13C-NMR spectra). Obviously, the depolymerization process favors self-bonding. As a result of high molding press temperatures, the hanging pCE molecules were cleaved, as reflected by the 2D-HSQC spectra. Demethoxylation was also apparent from the corresponding quantitative 13C-NMR spectra. However, for the decreased H-type phenolic hydroxyl groups (H-type lignin and pCE-OH), the cleavage of pCE was the dominant reaction during the molding press process. Furthermore, there was no significant difference in the content of carboxyl groups among these samples, suggesting that chemical oxidation was not a main reaction during the molding press process. The relationship between quantitative structure and thermal properties of lignin was reflected by the TGA and quantitative NMR data from the lignin fractions. In general, the thermal stability of lignin depends on the various functional groups, degree of branching, condensation, and its specific chemical structures. Furthermore, the thermal properties including the maximum decomposition temperature (TM), the maximum decomposition rate (VM), flowing property of lignin under high temperature, and energy consumption property were also investigated. Figure 6 shows a TG curve indicating the weight loss ratio of these lignin samples. It was found that the typical weight losses in TG curves became slow at temperatures greater than 600 °C, with a slow release of the final products before final char formation. In addition, the methoxy groups released methane around 400 to 600 °C (Yang et al. 2007). For raw MWL, the lowest residual carbon (21%) remained at 800 ºC. When the molding press temperature increased to 180 ºC (MWL-1), the ratio of residual carbon was enhanced to about 34%. However, with the molding press temperature further elevated to 230 ºC for different times (10 to 30 min, MWL-2 to MWL-4), the ratio of residual carbon increased from 24% to 32%, suggesting that the lignin became more complex and condensed, reflecting the increasing C-C bond ratio. In contrast, the ratio of residual carbon in MWL-5 (38%) was higher than in MWL-4 (32%), implying that there were more condensed structures in MWL-5 than in MWL-4. The more complex and condensed structures of MWL-5 were supported by the higher S/G ratio (2.29) of MWL-5 calculated from 2D-HSQC spectra. The higher S/G ratio also adds some clues that G-type units were involved in the formation of condensed G units under the harsh condition, although the condensed units cannot be detected by 2D-HSQC spectra. Additionally, the lower ratio of residual carbon in MWL-6 compared with MWL-3 suggested that the addition of biorefinery lignin delayed the condensation process during the molding press. In other words, the addition of lignin into bamboo particles affects the homogeneity of bamboo particles. However, the addition of isolated lignin in wood enhances the internal bonding strength of binderless boards under mild conditions (180 ºC, 5 MPa) (Li et al. 2015). The DTG curves (Fig. 7) of the MWL samples displayed more differences. The maximum decomposition temperature (TM) was defined as the corresponding temperature of the maximum decomposition rate (VM). For raw MWL, the TM was 360 ºC. The TM for the MWL samples extracted from binderless boards after the molding press process increased to higher temperatures (361 to 369 ºC). For raw MWL, there was a major decomposition peak at about 250 ºC, implying that some weak bonding (i.e., PCE) degraded under these temperatures. Along with TG and DTG analysis for investigating thermal decomposition characteristics of molding press treated lignins, differential scanning calorimetry (DSC) curves of the lignin are shown in Fig. 8 (Kim et al. 2014). 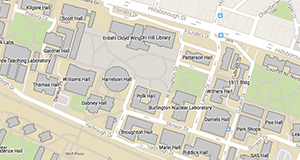 DSC curves show energy consumption. Heat flow was constantly negative up to 180 ºC in all lignin samples, implying that the molding press treated lignins exhibited overall endothermic reactions in the temperature range used in this study. Interestingly, the glass-transition temperature (Tg) was found only in the DSC curve of MWL-1, and the definite Tg was 114.5 ºC, suggesting that the MWL in the MPB-1 was liable to flow and permeate in the plant fibre, leading to improved IBS. The cleavage of β-O-4′ and attached PCE molecule, demethoxylation, and an increase of phenolic hydroxyl groups occurred during the molding pressing process of bamboo. The optimal internal bonding strength (0.98 MPa) of the bamboo binderless board was obtained at 180 ºC for 20 min. Although the lignin obtained under this condition was structurally similar to raw MWL, the decreased molecular weight, increased phenolic hydroxyl groups, and observable glass-transition temperature (thermal softening of lignin) all promoted the formation of binderless boards from bamboo, finally obtaining an acceptable internal bonding strength. The authors are grateful for the support of the Project Supported by Special Fund for Forest Scientific Research in the Public Welfare (No. 201504507), the National Natural Science Foundation of China (No. 31500486, 31430092, 31170532), and Forestry Science and Technology Extension Project (49). Björkman, A. (1954). “Isolation of lignin from finely divided wood with neutral solvents,” Nature 174(4440), 1057-1058. Faix, O. (1991). “Classification of lignins from different botanical origins by FT-IR spectroscopy,” Holzforschung 45(s1), 21-28. GB/T 11718 (2009). “Medium density fibreboard,” Standardization Administration of the People’s Republic of China, Beijing, China. Imam, S. H., Gordon, S. H., Mao, L., and Chen, L. (2001). “Environmentally friendly wood adhesive from a renewable plant polymer: Characteristics and optimization,” Polymer Degradation & Stability 73(3), 529-533. Kumar, R., Choudhary, V., Mishra, S., Varma, I. K., and Bo, M. (2002). “Adhesives and plastics based on soy protein products,” Industrial Crops & Products 16(3), 155-172. Mobarak, F., Fahmy, Y., Augustin, H., Mobarak, F., Fahmy, Y., and Augustin, H. (1982). “Binderless lignocellulose composite from bagasse and mechanism of self-bonding,” Holzforschung 36(3), 131-136. Shen, K. C. (1986). “Process for manufacturing composite products from lignocellulosic materials,” U.S. Patent No. 4,627,951. Suzuki, S., Shintani, H., Seungyoung, P., Saito, K., Laemsak, N., Okuma, M., and Iiyama, K. (1998). “Preparation of binderless boards from steam exploded pulps of oil palm (Elaeis guneensis Jaxq.) fronds and structural characteristics of lignin and wall polysaccharides in steam exploded pulps to be discussed for self-bindings,” Holzforschung 52(52), 417-426. Widyorini, R., Xu, J., Watanabe, T., and Kawai, S. (2005). “Chemical changes in steam-pressed kenaf core binderless particleboard,” Journal of Wood Science 51(1), 26-32. Yang, H., Yan, R., Chen, H., Lee, D. H., and Zheng, C. (2007). “Characteristics of hemicelluloses, cellulose and lignin pyrolysis,” Fuel 86, 1781-1788. DOI: 10.1016/j.fuel. Zhang, A., Han, Z., and Xue, L. (2014). “A non-formaldehyde wood fiberboard production methods,” China Patent No. 201410,076,627.5. Article submitted: September 18, 2016; Peer review completed: November 4, 2016; Revised version received and accepted: November 16, 2016; Published: November 23, 2016.